The regular evening game of the Paradise Men’s Softball League is interrupted when the body of a young woman floats to the surface of the adjacent lake. Since no one can identify the shooting victim, and no one answering to her general description has been reported missing, Police Chief Jesse Stone (Trouble in Paradise, 1998, etc.) relies on routine inquiries and a telltale class ring to identify her as Elinor (Billie) Bishop, universally labeled the “town pump” by her fellow high-school students. Billie’s reputation is so dire, in fact, that her own parents deny she’s their daughter. The only link Jesse can find for Billie is to the shelter for runaways that Sister Mary John runs in Jamaica Plains. But that link leads in turn to Alan Garner, whose telephone Billie had given as a forwarding number when she left the shelter, and to Garner’s boss Gino Fish, the well-connected gay Boston mobster Parker’s major-league sleuth Spenser (Potshot, p. 209, etc.) has tangled with now and again. All Jesse has to do is follow the links—if he can tear himself away from the bottle, his ex-wife Jenn, his current love interest Lilly Summers, and the rest of Paradise’s troubled citizens for long enough. 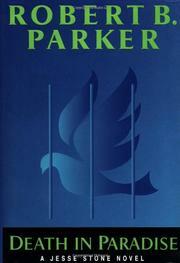 Parker regulars will find the same extraordinary stillness—as if every scene were still another frozen tableau—that marks the more famous Spenser novels. What they won’t find this time is enough action, detection, or real mystery to keep a self-respecting short story from starving to death.